“Floating” is a masonry term that means to “smooth out,” as in smoothing the sharp enamel points on the outside of the upper cheek teeth and the inside of the lower teeth. There is, however, much more to routine dentistry than removing enamel points. 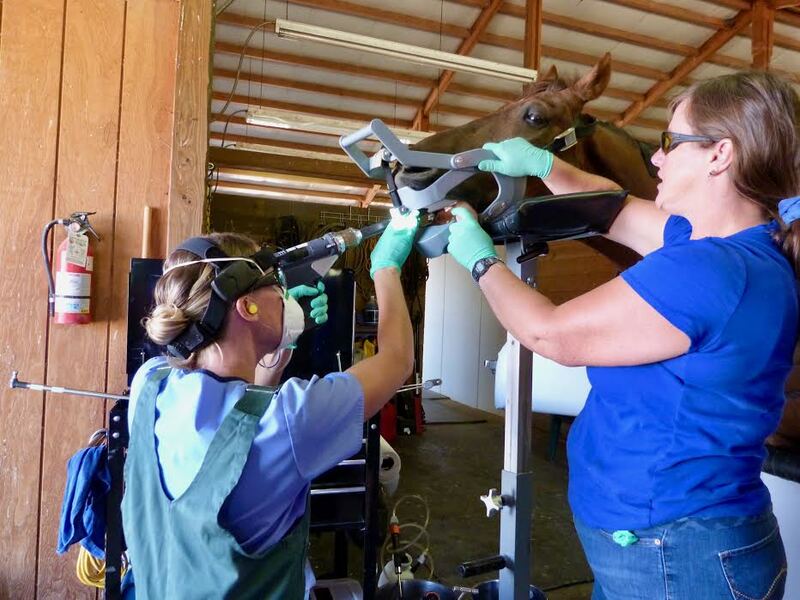 Equine dental practitioners should perform a thorough examination and use the ﬁndings to develop a treatment plan accordingly. The plan includes addressing any abnormalities in the teeth coming together (malocclusions) along with other dental pathologies such as sharp enamel points, waves, hooks, steps, ramps incisor alignment, and buffing canine teeth. A dental chart is completed documenting the examination ﬁndings, procedures performed, and future recommendations. This will be provided to the owner at the end of the appointment. More appropriate terminology for complete and proper dentistry, rather than “ﬂoating,” may be the comprehensive ﬂoat, occlusal equilibration, or balancing the mouth. Regardless of the name you prefer, the comprehensive ﬂoat involves examining the horses entire mouth and forming an individual dental plan for both horse and owner.